Bill Tilden won 10 grand slam titles during a glittering but controversial career, seven of them at the U.S. Open. 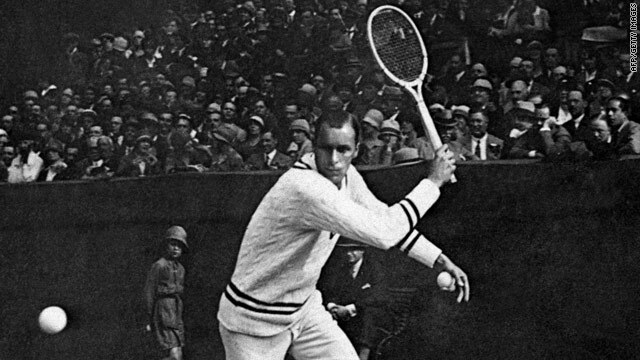 (CNN) -- Bill Tilden was a controversial tennis legend who dominated the sport in the 1920s, but died in disgrace. The American achieved fame and fortune through his tennis exploits and befriended Hollywood stars such as Charlie Chaplin, but he spent over a year in jail in the 1940s on a morals charge, which ruined his reputation before his untimely death in 1953. Tilden won his six straight U.S. Open titles from 1920-1925, a record since the tournament abolished the challenge system -- where the champion automatically qualified for the final -- in 1911. Under that system, Richard Sears won the first seven editions of the U.S. Open (then the U.S. National Tennis Championships) in the 1880s. Last year, world No. 1 Roger Federer failed in his bid to match Tilden's record when he was beaten in the final by Juan Martin Del Potro. Tilden, who claimed his seventh U.S. Open title in 1929 as well as being twice a losing finalist, goes down in the history books as one of the greatest tennis players of all time. A relatively late starter, Tilden struggled to get into his college tennis team in Pennsylvania, but years of dedicated practice started to bear fruit after the First World War as he reached the U.S. Open finals of 1918 and 1919. He reached his peak in the 1920s, winning his first U.S. Open title and holding the world number one spot for seven straight years. Tilden also led the United States to a record seven straight Davis Cup titles as well as claiming three Wimbledon titles. His famed "cannonball" serves worked particularly well on the fast grass surfaces on which the U.S. Open and Wimbledon were staged. Tilden never won the French Open, being losing finalist in the last year it was held on grass courts, in 1927, and 1930 on clay. Eventually joined by the likes of Ellsworth Vines, Fred Perry and Don Budge, Tilden remained a star attraction until well into his 40s, filling arenas such as Madison Square Garden in big-money matches. But off the court, Tilden was a controversial figure, battling with tennis officials as his amateur status was called into question, and he was accused of being arrogant and inconsiderate. Tilden, who never married, saw his reputation destroyed in the 1940s when he was found guilty of a morals charge in connection with a minor. He served seven-and-a-half months of a year's jail term, but was arrested again in 1949 after picking up a 16-year-old male hitchhiker. Tilden served a further 10 months for his probation violation and was shunned by the tennis community. His friendship with Hollywood stars such as Chaplin and a love of the theatrical world saw Tilden pour much of his riches into less-than-successful Broadway productions. He died a tragic figure in 1953, having a stroke in Los Angeles as he prepared for a trip to play in the U.S. Pro Championships despite his 60 years of age. Tilden was inducted into the International Tennis Hall of Fame in 1959, and in any polls of all-time great tennis players he always features in the top order.